The drive from Vancouver to Banff National Park was a pretty long one, so we decided to break it up into two days. We thought about finding a hotel along the way, but we heard that Canada has some great provincial parks, so we decided to give one a try. 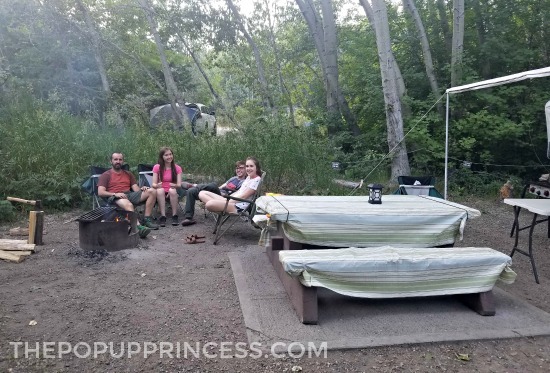 We grabbed a site at Bear Creek Provincial Park just outside of Kelowna, and it was a perfect place to stop. The sites were clean and spacious, and there were flush toilets and showers in each loop. 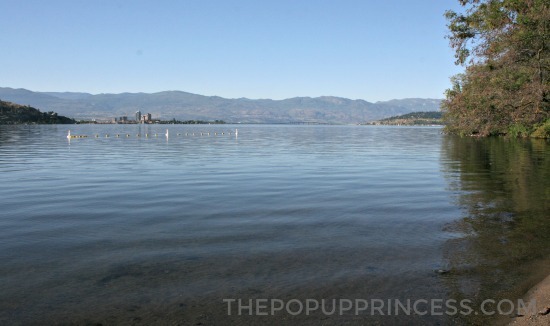 The campground is on the shores of Okanagan Lake, and is a popular destination for swimming and waterskiing. We had hoped for a lakeside site, but many of those in our loop were closed due to flooding. Although the campground was very family friendly, we also noticed that parts of our loop tended to have a party atmosphere. There were several campers that were blaring music well into the night, but because we were only there overnight, we weren’t terribly bothered. 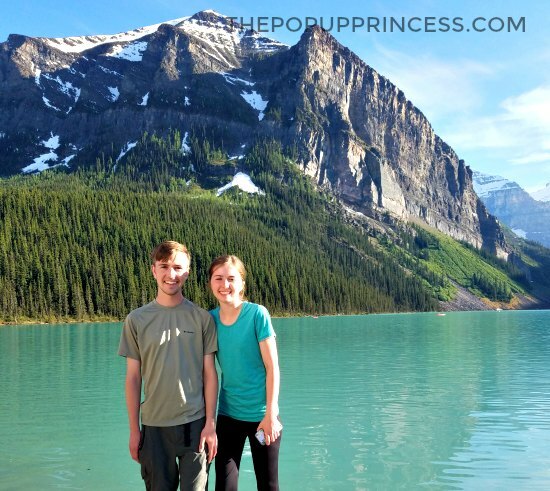 We made the best of our stay and hit the road for Banff early the next morning. 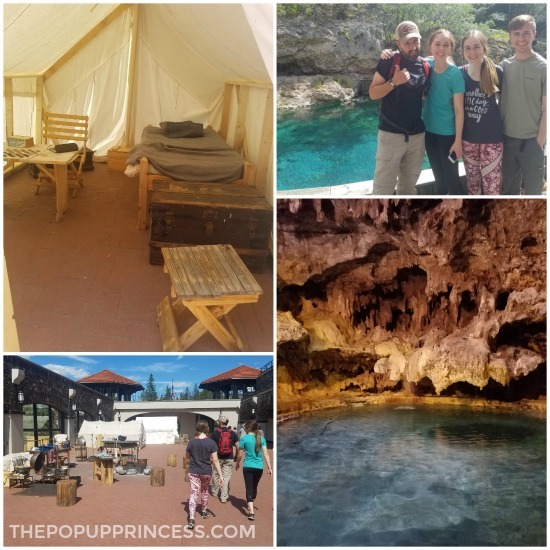 We knew we would need showers and clean bathrooms for our stay in Banff National Park, but we didn’t mind camping without hookups. Since we only had a few days in the park, we were determined to make the most of our time. That meant spending as much of our day away from camp as possible, so our campground amenities weren’t a top priority. 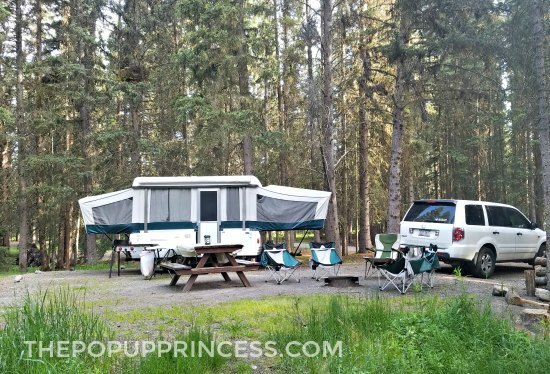 We made reservations for Johnston Canyon Campground, as it seemed pretty centrally located to everything, and we were pleasantly surprised at how much we loved it. The sites were spacious and included a picnic table and fire pit. The bathrooms, which were heated and impeccably maintained, weren’t far from our site. Warm showers were included in our camping fees, and we certainly made the most of that. 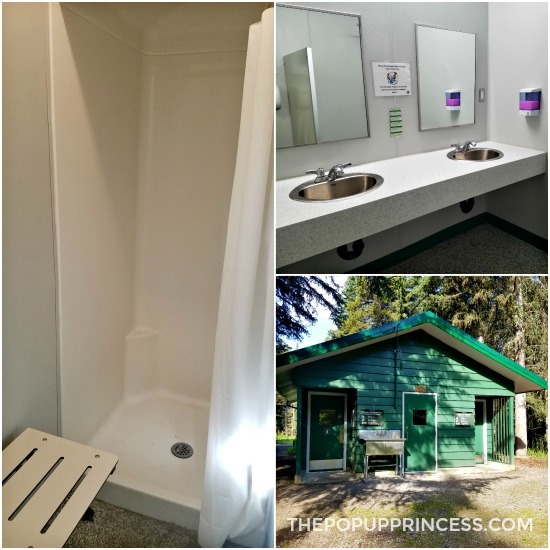 Campground showers can always be a little hard for my teenagers, but they loved how clean and private the bathrooms at Johnston Canyon were. There are 132 unserviced (no hookups) sites, all reservable online in advance. I’d suggest making reservations early, as this campground fills up quickly. 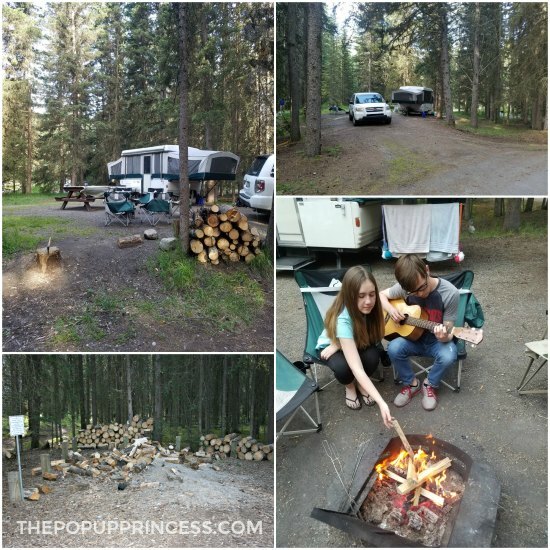 Johnston Canyon is a big campground, but we were surprised to find it was very peaceful. We had a whole troop of Boy Scouts camping in the site across the road, and we didn’t hear much of them at all. We felt pretty secluded, even though it was obvious that we weren’t. For a nominal fee ($8.80 CAD per day), we were also able to purchase a fire permit, which included unlimited firewood. We made the most of that, too, spending our evenings around the fire, cooking meals and playing guitar. After a busy day of exploring, it was pretty idyllic. 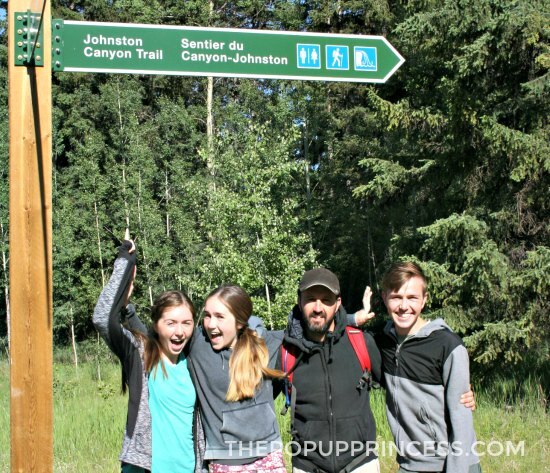 We had three nights in Johnston Canyon Campground, but only one full day to explore Banff. This meant that we had to pack in a full day of sightseeing. First stop? Johnston Canyon! The Johnston Canyon Trail is beautiful, but like most areas in Banff, the parking can get insane. I was thrilled when we discovered that the trailhead for the hike started just steps from our campsite. This meant we were able to enjoy the hike without worrying about parking the car. The actual hike is just over 3 miles round trip, and so worth it. Be aware that it is one of the most popular hikes in Banff, so there will be a lot of tourists. 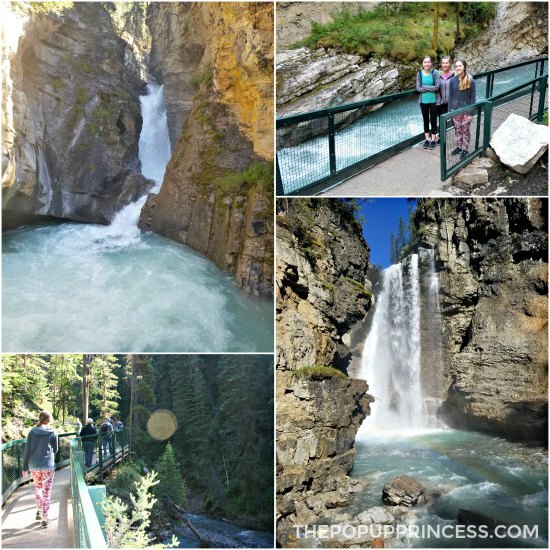 We got an early start–Johnston Canyon was our first stop–and it was still pretty crowded. The earlier you get there, the fewer crowds you’ll encounter. The hike meanders through Johnston Canyon, overlooking the creek. At several points, the trail runs along iron catwalks attached to the canyon walls. You can see and hear Johnston Creek rushing beneath your feet, and it is pretty spectacular. We hiked to the upper falls area, and thought it was a perfect little hike. If you have time you can hike even higher to the Ink Pots, which are cold bubbling mineral springs, located about 3 km from the upper falls. Since we were short on time, we turned back at the upper falls, but we could have easily spent an entire day in Johnston Canyon. From Johnston Canyon, we hopped in the car and ventured in to the town of Banff. This was actually a bit of a happy accident. We were looking for the Cave and Basin National Historical Site. 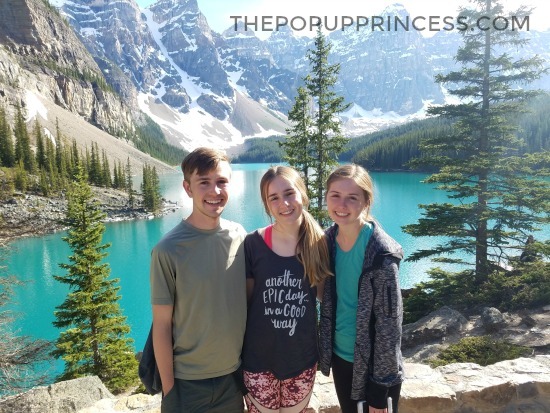 There were no plans for shopping on the itinerary, but as we were driving around town looking for parking, we all fell in love with the charm of downtown Banff. We parked the car, grabbed some coffee, and walked the town for a bit. While strolling through town, we discovered the Banff Park Museum. Admission was free, and they had a great collection of wildlife exhibits. 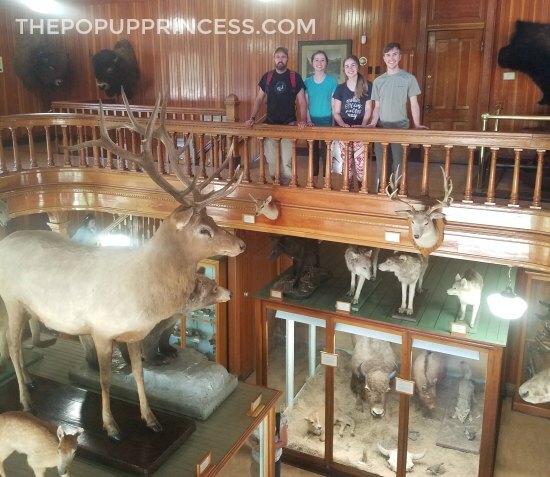 We got a firsthand look at some amazing animals, but we also got a good look at the oldest surviving federal building in Canada’s national parks and one of the oldest museums in Canada. It’s a very cool Victorian era log cabin, and the staff was super friendly, too. Then it was on to the Cave and Basin National Historical Site. When my kids hear “historical site,” they usually roll their eyes, but this part of the park was actually pretty cool. We were able to see (and smell! 😆 ) the natural mineral pool beneath the museum. We also got an opportunity to learn more about Banff and learned that this area is actually the birthplace of Canada’s national parks. This historical site was also free during 2017, but the regular fees are actually quite affordable. Admission for adults is $3.90 CAD, and youth are free. We had been eager to see Moraine Lake for years, so this stop was the highlight of our visit. I cannot even describe to you how beautiful this lake is. The pictures above were taken with our cell phone–no filter necessary. That is really the color of the water. It is amazing. It is also really popular. The rangers all told us to visit the lakes before 10am or after 6pm if we wanted to avoid the crowds. We actually arrived around 6:30pm, and it was still pretty busy around the lake. We had to wait in a line of cars to find parking, and once we hiked up to the overlook, there were people everywhere. I can’t even imagine how busy it was earlier in the day. The downside to arriving so late was that the kayak rental shop had closed up for the day. We were counting on kayaking the lake, but were unable to check that off our list. 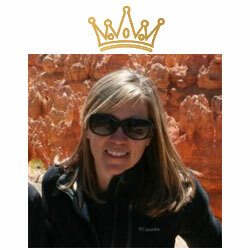 If it is something that is in your travel plans, I would suggest confirming the rental shop’s hours ahead of time. After visiting Moraine Lake, we headed to Lake Louise. Lake Louise was much easier to access, and the parking situation wasn’t quite so difficult. It was still very crowded at 7:30pm, though. We encountered so many people, there was no room to take a good picture of us together by the lake. Honestly, this area was beautiful, but after seeing Moraine Lake, we probably weren’t as impressed as we should have been. Moraine Lake was just that much more beautiful. 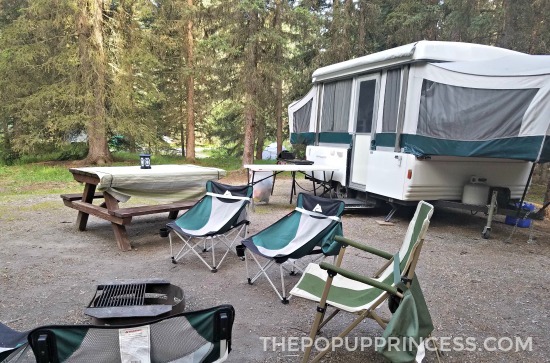 We used Johnston Canyon Campground as a home base while exploring Banff National Park, and it worked quite well. The campground was impeccably maintained, and it was fairly inexpensive, too. Sites have no hookups, but there are heated bathrooms with free, hot showers and flush toilets. There are also picnic shelters, firewood stations, and water spigots throughout the campground. The sites can accommodate RVs up to 27 feet in length, and cost $27.40 CAD (around $22 USD) per night. We suggest reserving early, especially during the summer, as this campground does fill up fast. 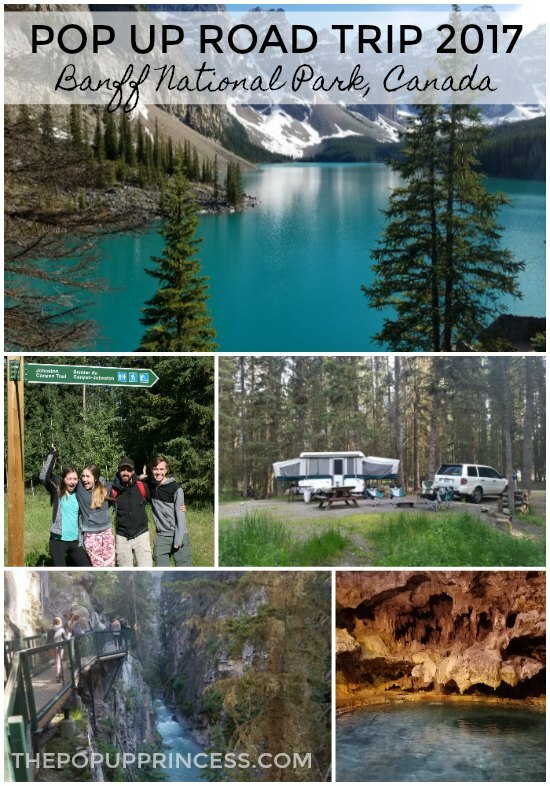 If you are looking for a campground with hookups near Banff, check out the Tunnel Mountain or Lake Louise campgrounds. The sites are slightly more expensive and fill up fast, but the sites at these campgrounds can accommodate larger RVs. 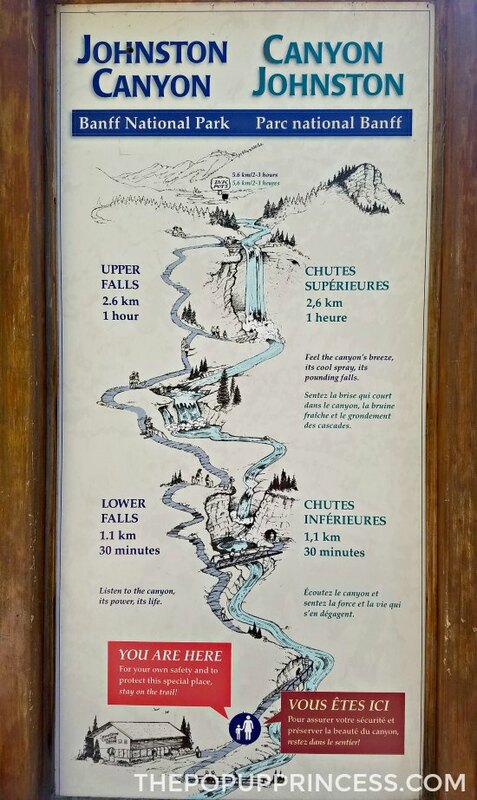 If hiking is your thing, don’t miss Johnston Canyon. The hike is absolutely gorgeous, and it isn’t too strenuous either. It takes about an hour or so to hike to the upper falls, but it is well worth it. If you are short on time, consider hiking to the lower bridge, where there is a small cave behind the falls. Parking can get crazy, so arrive early! Although it is a little bit of a drive, Moraine Lake is an absolute must-see. It makes for breathtaking pictures, and if you arrive early enough, you can rent a kayak and paddle the lake. Parking here is very difficult and Moraine can get crowded fast. The park ranger we spoke to recommended visiting the lakes before 10am or after 6pm. Lake Louise is another Banff National Park “must-see” location, but like Moraine Lake, it gets crowded quickly and parking can be difficult. We found Lake Louise to be more crowded and less magnificent than Moraine Lake, so if you are short on time and can only squeeze in one visit, choose Moraine. If you have the time though, definitely put Lake Louise on the itinerary. Most of the places in Banff National Park are crowded during the summer, and downtown Banff was no exception. It is a charming town, though, and well worth a visit. Consider grabbing a meal or treat at one of the many cute cafes in town. The museum and Cave and Basin area are also worth a visit. If you are visiting for an extended period, there are bike trails all along the water that would make for an amazing afternoon excursion. Although we were able to see much of what we set out to see, we could have easily spent a week in Banff National Park. If this amazing spot is in your vacation plans, we’d suggest allowing yourself at least three days to visit all the sights. We enjoyed this stop so much, we are already dreaming of a return visit. Have you been to Banff National Park? We’d love to hear your tips and suggestions on what to see and do next time around. Beautiful!! Banff along with Glacier National Park are on our family bucket list to visit. Thanks for sharing!! Where did you go to get your pass for Canadian parks? How much did it cost? We have two small children I think are going to be free. We were in Banff and Jasper this past summer and heading back next summer to camp at Jasper. We rented a canoe at Lake Louise. Once you get out to the middle of the lake it is so peaceful you would never know the place was packed. The lakes at Jasper were packed as well but your pictures of Lake Moraine look just like the ones we took at Lake Mogilne. One other point. We took the shuttle from Banff to Lake Louise. Best decision because then we did not have to worry about parking. We aren’t camping unfortunately but I do have a reservation for a few nights near Banff. Do you think it’s too much to visit Glacier for a few nights and then drive up to CA to see Banff? Just trying to fit it all in but I am afraid I can’t do both this year! Hi. Were you and your family cold at night while camping without hookups? I know the temperature drops a lot in Banff. We weren’t at all. Our heater runs on propane, so we always had that if we needed it, but we must have visited during a warm spell. It never kicked on, and blankets were more than enough.